I recently aquired another great historical document for the Club's archives. A past member expired and the family left some of his Club related posessions with us. Amongst the items was this article from the 1898 Tacoma Sunday Ledger (TSL). This is an interesting read as we sit today waiting for the course to thaw out. Long ago, the golf season started in September and ended when the dry summer months made the playing field too dry and dusty for good golf. 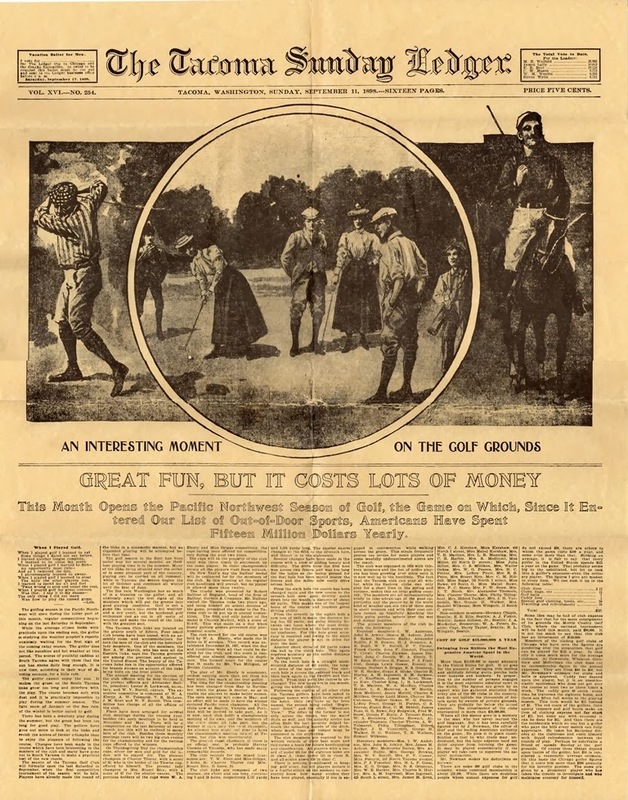 The latter half of this article talks about the cost of golf in general and that is also interesting, and very different than today. For example you will read that in 1898, the annual cost of golf equipment (i.e. clubs, bags, and balls) was more than the club's dues. Also you might catch that at the time of this writing, there are 600 clubs in America. Tacoma C&GC was one of the first 90 clubs in America when it was established in 1894 so there was astonishing growth in the game at this time. I scanned the article and broke it up into larger images which makes it easier to read. Enjoy.